Do you love point & click adventures from the 90s? You're in right place! Become a hero, who is solving puzzles in different locations doing his best to get back to his home and family. Lot's of gadgets from those times, good sense of humor and unforgettable dialogs, which will entertain you. We've posted critical update (Windows build) for players with game controller. For some of them there was issue on outdoor scene that make game crashed. Also playing minigame in the room was limited only to gamepad. You can now play using keyboard even if gamepad is connected. Have a lot of fun and nostalgia with Back to 1998. It's like in real life, there is no SAVE GAME option. "Back to 1998" is a modern game with retro look and feel. Use your mouse or finger to find hidden objects. Use them wisely to solve puzzles and discover new adventures. 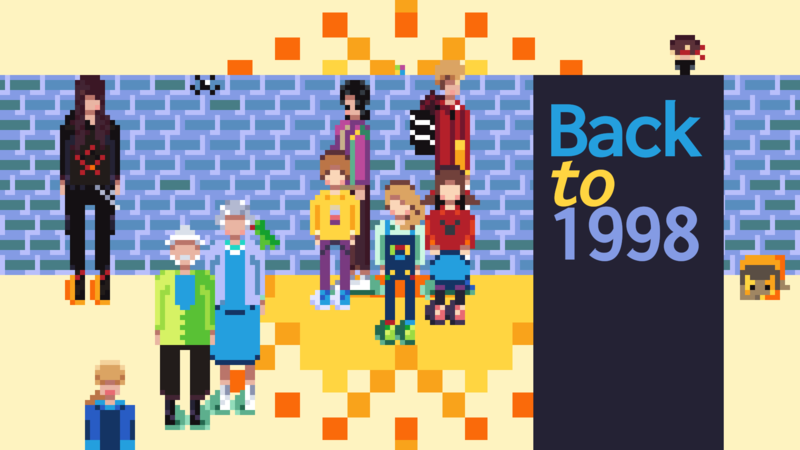 Meet plenty of different characters in "Back to 1998" and have a chat with them. Help them so they can help you win the game. And don't mess with the cat! A lot of objects from the 90's that you can use in "Back to 1998" game. Connect items together to get something new. Solve puzzles based on funny hints hidden in the game. You're in the '90s so arcade games are your friends. Visit the owner of an arcade in "Back to 1998" to get something useful for your mission. What's the mission? Check in the game. Seek on different locations in "Back to 1998" for items that may be useful. Some of them can be easily found, some are a bit hidden. Try to get everything to finish the game. Find floppy disk, repair your home computer and play a game to get the highest score. Play some old arcade games. Lots of fun and nostalgia in "Back to 1998".